Includes pocket clip; closed length: 4 1/2"
So cool, so unique! 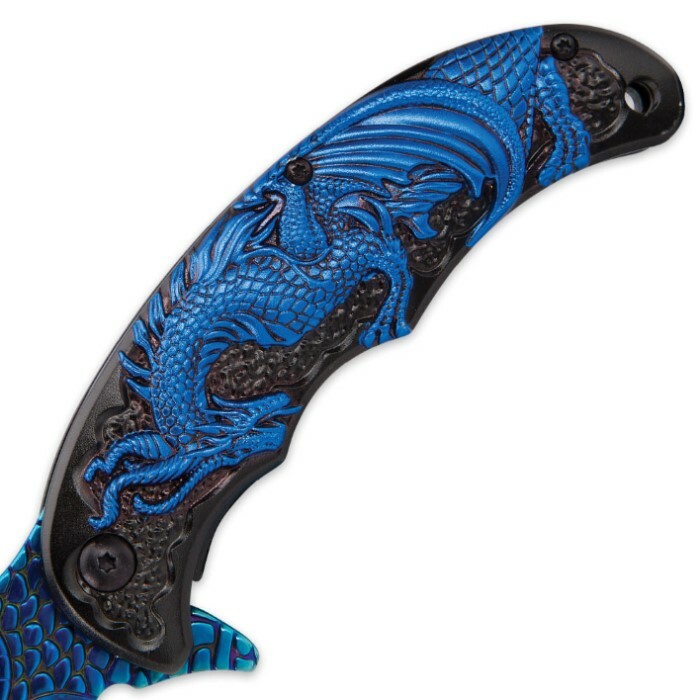 The Blue Dragon Pocket Knife features a distinctive dragon design that is strikingly beautiful, while imparting it with an eerie reptilian vibe. 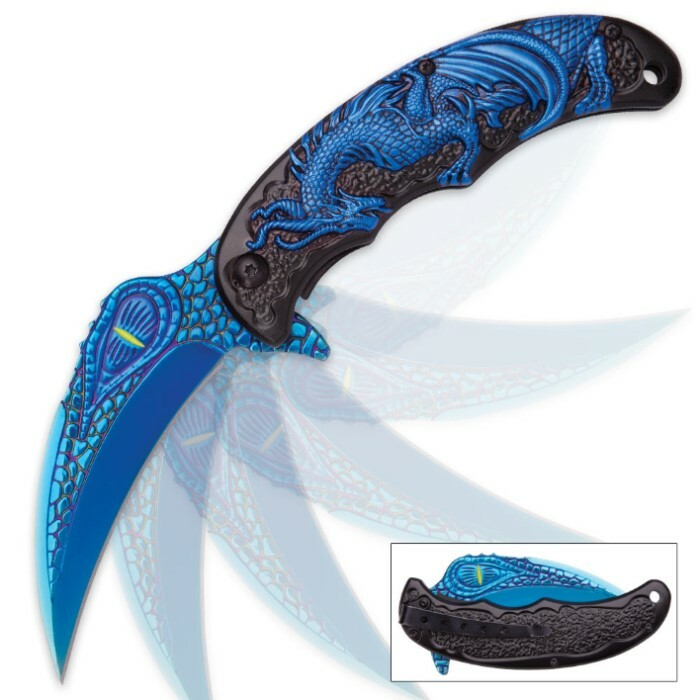 Fiercely curved like a raptor talon, the brilliant iridescent blue blade is studded with three-dimensional dragon scales, and the sinister vertical pupil of the blade's ever-gazing eye adds an especially menacing touch. But don't be fooled - this is no mere fantasy knife. The razor sharp 3" 3Cr13 steel packs ample bite to back up the knife's frightening look. Seeing it fly open at lighting fast speed with the assisted opening mechanism is an especially impressive sight sure to scare off even the most tenacious foes. The anodized aluminum handle is just as tough as the blade and every bit as visually striking. It boasts a gorgeous blue dragon motif in relief and a comfortable ergonomic grip. At 4 1/2" closed, the Blue Chinese Dragon Pocket Knife fits comfortably in jeans pockets, especially with the integrated aluminum pocket clip. 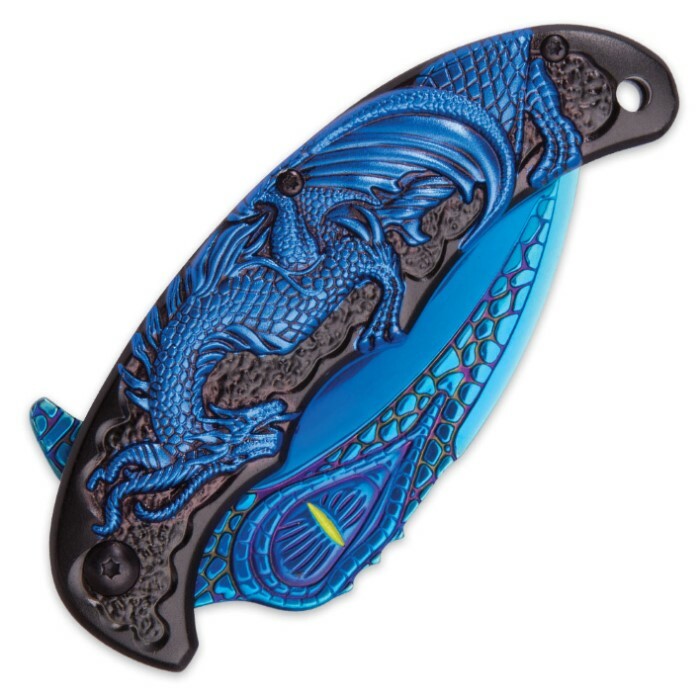 Whether you display it or wield it, the Blue Dragon Pocket Knife is sure to turn heads and tackle any job you throw at it. I love the blue dragon. It goes well with my dragon swords & other dragon collection. But, again, the clip is on the wrong end for quick and easy deployment ! Still it is well worth the money . The spring assist mechanism works amazingly well, and the knife blade (with some sharpening) is also very good. The detailing on the handle and the knife is amazing. I originally bought it as a gift, but I think I'll be keeping it for myself.